Name meaning 'growing along streams'. Rheophyte, usually in groups on river banks, in rocky (fast running) stream beds, and along the coast. Soil usually (temporarily) inundated, in some areas for months. Anchorage of the plants superb. Flowers are presumably wind pollinated. The seeds are very hard and durable; they sink in water and may be transported by the river into even the sea, where they can still germinate in salt water along the coast. Soil: limestone, rocks (gravel), sand. Alt. : sea level up to 1000 m.
Widespread, found in Bhutan, India, Sri Lanka, Myanmar, southern China, Taiwan, Laos, Cambodia, Vietnam, Thailand, and throughout Malesia (on Borneo Sabah only), but rare towards the east (Moluccas, New Guinea). The plant is used as medicine against different diseases. Laos: decoction of leaves to be used against itch. Cambodia: stem and leaves are used as a medicine to depurate the skin of diseases, young leaves and shoots produce hair oil, and wood is used in an infusion against malaria. Thailand: mashed and powdered leaves are a treatment against skin eruption. Malaysia (N Perak): pounded leaves and fruits are used against skin diseases too, either in a poultice and/or as a decoction to be drunk. Java: Used as a medicine, unknown for which cause; also used to fasten loose teeth. 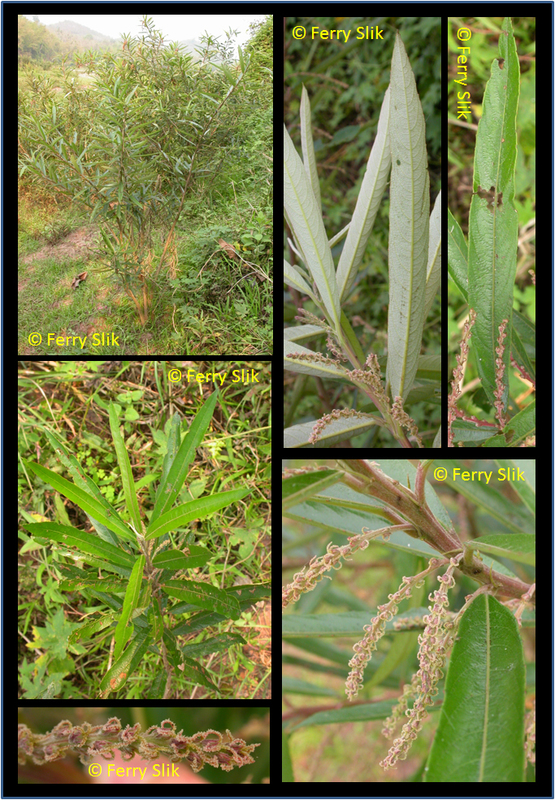 S Philippines: the plant may be a stimulant against certain venereal diseases; a root decoction acts as an emetic, while water running at the foot of the shrubs may have depurative properties. Due to the elaborate and large root system the plant is used in N. Sumatra (Gajo lands) and Java to protect river banks or is planted to prevent erosion. The saps of the plant may dye teeth black (Java). In South China the bark is used as rope. The leaves are used for forage in Vietnam. The root is used to make bolo handles (Sabah, N Borneo). Borneo (Sabah): Bongai tidong (Idahan); Parang-parang (Bajan). Burma: Kyauk(a)naga, Momaka, Nyin ye bin. China: Shui liu, shui yeung mui. India: Sherni (Hindi); Raan kaner, Sherni (Marathi); Kattalari (Tamil); Neervanchi, Puzhavanchi (Malayalam); Adavi ganneru (Telugu); Hole nage, Niru kanigalu (Kannada); Thotthori (Oriya); Hil-kadam, Tuipui-sulhla (Assamese); Jalangmynrei (Khasi); Jalavetasa, Kshudrapashanabheda (Sanskrit). Java: Kajoe soebah, Keding djati, Soebah/Sobah, Tambahoea (Javanese); Djoerai/Joerei/Tjoerei/Tjurai (Sundanese). Lesser Sunda Islands (Flores): Kenga waé, Mela waé. Malay Peninsula: Willow spurge (English); Kalire (Batek); Champenai, Kelereh, Kayu suarah, Mempenai, Kelerai. Philippines: Agooi, Agoioi, Agukuk, Balanti, Dumanai, Kagoioi, Lumanai, Lumanaia, Apoioi mangagos, Managos (Tagalog); Baha (Tagbanua); Balanti (Zambal); Daguwas (S.L. Bis); Dumanai (Iloho); Hangarai malabugos, Miagook, Miagus (Bisaya); Liuhon (Sambali); Mamalis (Ilog). Thailand: K(l)ai nam (Lao); Klai hin, Mai kerai, (Ta)kri nam. Sri Lanka: Omi, Werawala (Singh). Sumatra: Sangka, Sangkir (Malay); Sansang haroes/Sesang aroes (Lampung); Serkil (Gajo Lands). Vietnam: Cây rù rì nuóc, Rì rì, Rù rì.